Since its inception in 1983 khemka containers have always diversified into new things coming up and garbing every opportunity to provide its customers with qualitative products at the time promised. So, speed quality and innovation had always been the main ingredients to cater more and grow more. The very recent development within the plant is manufacturing of lined cartons. 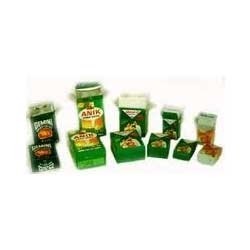 Our Liner Carton is widely used in the packaging of products like tea, masala, ghee, oil, concentrates etc. Our all type of Liner Carton is available in finest texturing and finishing. Under the team of our experts, our Liner Carton are designed to suits all your comprehensive requirements. We are availing our Liner Carton at very affordable price range. We cater inquiries from pune only. We are extremely praised in the market for offering a wide range of Liner Cartons. Owing to top quality, these are enormously praised by our valued customers. We are offering Lined Cartons, which are fabricated by using high quality raw material. These cartons are used for packing powder such as spices, milk powder, bakery powder etc. These cartons can also be used for packing foods such as corn flakes, candies etc. A liner carton is a folding carton that has an inner protective barrier packaging of an aluminium or paper liner. Suited for items that require resistance from direct contact with air, or items that are semi-liquid, such as Ghee, Tea, Spices, liner cartons form the perfect packaging solution for consumers. Additionally, they tap into the consumer mindset of a safer and better protected product. We provide our customers an excellent quality range of Liner Carton, Our all type of Liner Carton is available in finest texturing and finishing. Under the team of our experts, The solution is reliable and versatile for different types of liner materials. These boxes are manufactured using supreme quality raw material, which is sourced from the authentic vendors of the market.